For children born in 2014/2015. This runs every Saturday at 9am in the Dome in the Spawell Complex. At the end of March we will move outdoor to Bushy Park. For children born in 2013/2013. This runs every Saturday at 10am in the Dome in the Spawell Complex. At the end of March we will move outdoor to Bushy Park. For children born in 2013/2013. This runs every Saturday in the hall of Our Lady's School, Templeogue. At the end of March we will move outdoor to Bushy Park. To Register you child for 2019 please download and complete the Registration Form at the bottom of this page and bring it along with the registration fee on 20th January. Each child must bring their football to training every week. Due to the impending arrival of Hurricane Ophelia, there will be NO TRAINING on Monday 16th for any teams. 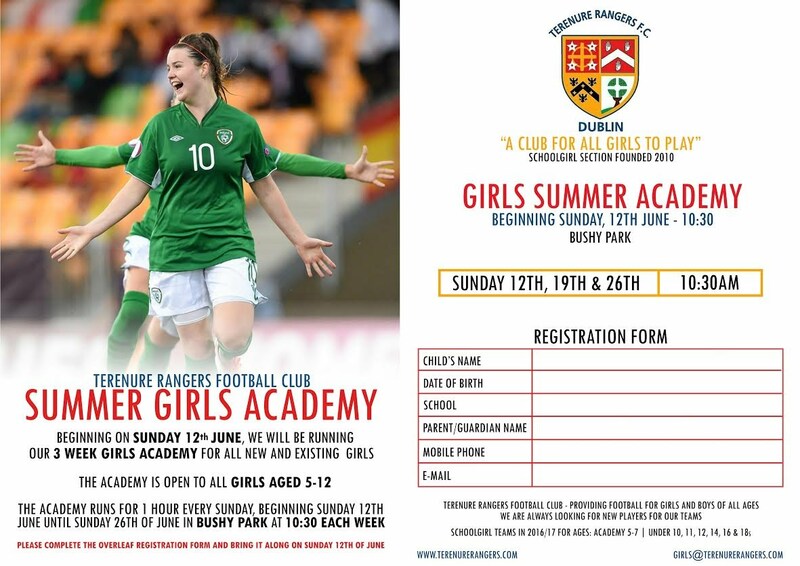 Terenure Rangers are delighted to be hosting the Aviva Soccer Sisters Camp in Bushy Park this Easter. The Camp is on Monday 10th and Tuesday 11th April in Bushy Park from 10am to 2pm. All girls will receive top quality coaching from FAI accredited coaches and will receive an exclusive Soccer Sisters Kit and football. Cost only €30 with discounts for sisters. 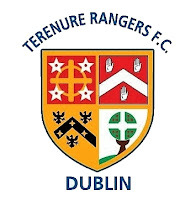 Terenure Rangers is currently looking for two volunteers to fill the posts of Childrens Officer. The appointment of Club Children’s Officers is an essential element in the creation of a quality atmosphere in any club. They act as a resource to members with regard to children’s issues and also ensure that children have a voice in the running of the club and can freely talk of their experiences. All clubs are required to have a Children’s Officer in place and appropriate training will be made available to them through the FAI in conjunction with the Local Sports Partnerships and The Irish Sports Council. All affiliated Clubs and Leagues are required to appoint Children’s Officers. Children’s Officers do not have the responsibility of investigating or validating child protection concerns within the club and have no counselling or therapeutic role. This responsibility lies with the Health Boards and Gardai. Our online registration and payment system is now open for 2017 subscriptions. This year the boys leagues have moved to a Calendar year so boys will be paying for the full year. The Girls Leagues are still Running from Sept - June so the girls will pay half the subscription to cover Jan - June 2017. We also have Family Plans with significant discounts for family members and the ability to pay in installments. Due to the different league seasons we were not able to display all the family Plan Options on the systems. If you have a mix of boys and girls registering or large families please contact Stephen on admin@terenurerangers.com and he will sort out your registration. Payments and registrations can be made now by credit or debit card. To register please click the "Join Here - Easy Payments Plus" button on the home page. Due to the weather Bushy Park is currently unplayable and there will be no matches in Bushy this weekend 4th/5th February. It is now law that anyone working with children 18 years or younger need to be Garda Vetted.Garda vetting has been an FAI Rule for all those working with children and or vulnerable persons (in a paid or voluntary capacity) for a number of years now. Please see FAI Rule 75 and the FAI Child Welfare Policy for more information. If you are not Garda vetted through the FAI, you should not undertake any work in a paid or voluntary capacity with children or vulnerable persons in football. Free Sunday Morning Soccer Academy for girls. 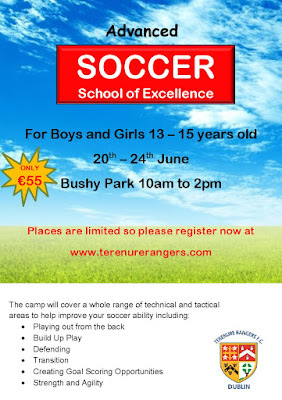 Terenure Rangers are delighted to host a School of Excellence for Boys and Girls aged 13 - 15 who wish to improve their football.